At PCI, we believe in the philosophy of ‘growth that drives growth’. It is said about the Koi fish that its growth is based on the environment it lives in. In a fish bowl, the Koi fish grows to only a few inches while in a pond, it can grow up to certain feet. Drawing from this analogy, we believe that an environment drives an individual’s growth. Which is why at PCI, we provide a work environment that is conducive for growth. The work environment at PCI is built around the belief of growth beyond boundaries. Some of the critical elements that define our work culture are as follows. Our work culture is open and inclusive. Everyone is immediately welcomed into the team, and has a significant role to play in driving the company forward. Our many work-life programs respond to the needs and aspirations of our employees while retaining fun as a key element. A ‘family feel’ characterizes the ethos within the company and this sense of belonging has created a loyal team of workers, executive and supervisory staff along with managers who implement its credo of high quality, ethical service to the customer. Technical and soft skill training is undertaken at the field level and at our well appointed Training Center at Karjat (Maharashtra). 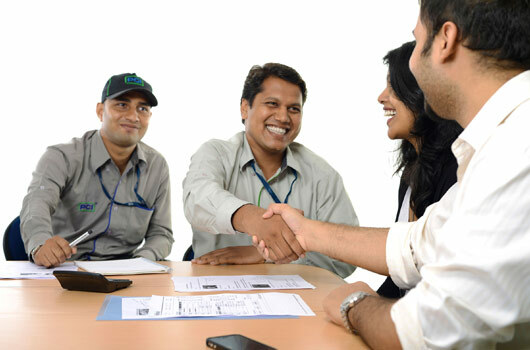 A dedicated Technical & Training Division undertakes the training programs. A team of in-house technical and soft skill trainers, with the assistance of consultants, is available for the regular induction training and refresher courses that are conducted. The Karjat Training Center (KTC) is a residential facility, located near the banks of the Ulhas river. The Center has an air-conditioned training room fully equipped with all facilities for round the year training. KTC is the venue for various staff training programmes and has also played host to regular batches of trainees from PCI's overseas associates.